We are facing massive changes in our climate - we are literally warming up our earths atmosphere by burning of fossil fuels with catastrophic results! Our icecaps are melting, sea levels are rising and we are seeing an increase in severe storms around our planet. These all impact on vulnerable species such as polar bears, who are literally starving themselves into extinction, as well as our environment which supports all life on earth (including ourselves). Reversing the effects of climate change is a challenge we must all take up! Visit the links below or start up your own local climate change action group. Get in touch and we'll show you how! National Geographic - Climate change 101- Bill Nye the Science Guy tells us the impacts of climate change on our planet and us in this short video and what we can do about it. Earth Guardians - a tribe of young activists, musicians and artists worldwide who are stepping up to take action for climate change! Greenpeace - a year to save the world? How crucial is 2015? Greenpeace - Making the big polluters pay - take action and spread the word! Go Fossil Free - Divesting from fossil fuels​ means removing investment in the companies that support fossil fuel extraction, and keeping oil, coal and natural gas - non renewable energy sources which pollute our planet and speed up climate change, in the ground. Before the flood - Join Leonardo DiCaprio as he finds out what needs to be done to prevent catastrophic runaway climate change. Why not now? - the next generation asks why nothing is being done for climate change. Morgan Freeman talks about a change to stop climate change. 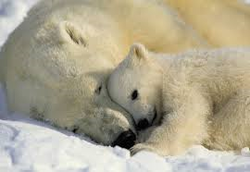 Thumbnail image: Polar Bear and her cub.